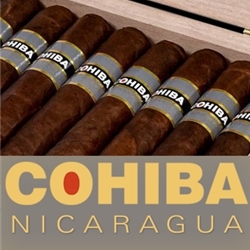 Cohiba Nicaragua is the first line of Nicaraguan hand-rolled premium cigars to be released by the Cohiba brand. These premium cigars are blended finest hand-selected tobacco leaves from the volcanic soils of Estelí and Jalapa. Cohiba Nicaragua premium cigars are constructed with Nicaraguan tobaccos for the binders and fillers and delicately dressed in a rich reddish mocha brown Honduran Colorado Oscuro wrapper. The Cohiba Nicaragua offers a medium to full-bodied smoke with a slight oily texture to the touch releasing aroms of rich chocolate, black pepper, and leather. Smokers Discounts offers the perfect way to unwind with Cohiba Nicaragua premium cigars. Every cigar purchased on our online cigar store can be delivered right to your front doorstep. We’ve made it easy and affordable to buy hand-rolled cigars. A variety of sizes and flavors are listed below, each of these styles are in stock and available for a low discount price! Call us for more details!